So let’s say you’re hosting an event and you have tons of pictures to display, and you need a device that will provide a slide show of all your pictures. Or you’re sitting at home and you just can’t decide on the one perfect picture to display in your living room. Well now you don't have to worry! The folks at CenOmax have come up with a solution to your problem. TechwareLabs is pleased to have received the new 7” F7024B Digital Photo Frame. This digital photo frame caters to any style with its interchangeable frame plates and video/music playback fuctions all at the touch of a button! "It's your life...frame it with style!" The Perfect Gift for any occasion! Slideshow your precious moments with different frame styles to match your home décor, match your mood, or be part of that special occasion. Let cenOmax be part of your digital lifestyle! Transform that bulky photo album into the stylish digital photo frame and customize the way you share your photos. Rotate, zoom, select slideshow settings, and more all without a PC. There's no need to select only one photo for the living room frame anymore. Instead, show off your latest vacation, and special moments by displaying multiple photos on the digital photo frame directly from your memory card. Now you can slideshow your life moments with different frame styles to match your home décor, match your mood, or be part of that special occasion. 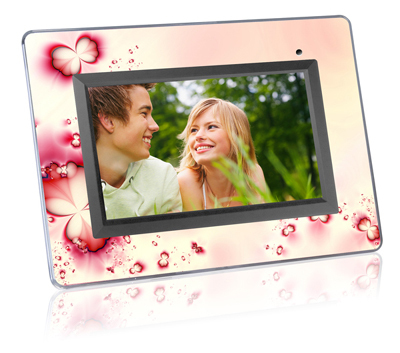 Let cenOmax digital photo frame be part of your digital lifestyle! cenOmax digital photo frame allows you to display as many photos as you like. It is more accessible than a PC and therefore offers the freedom of viewing your pictures in the living room again and again- there are no limits! Now let's find out what's in that box!